Pick any auspicious Hindu festival or the Grahan Kaal [Period of any Full or Partial Solar or Lunar Eclipse] or any auspicious Astrology Yoga to prepare this Yantra. 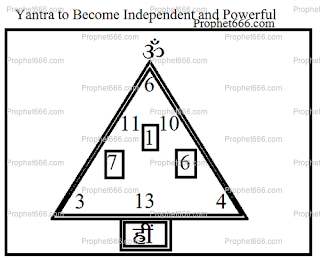 The Yantra must be drawn as show in the image on a Bhojpatra using Ashtagandha Paste as the ink and a Pointed Wooden Stick as the Pen. The completed Yantra must be worshipped sincerely, showing complete faith and devotion by offering the Yantra some pleasant flowers and lighting an Oil Lamp and Incense Stick in front of it. Finally the prepared Yantra should be put inside a transparent plastic cover so as to prevent it from getting soiled and damaged and then kept in the headgear of the practitioner. Headgear means the cap or turban worn by the practitioner. The wooden stick can be of any plant or specific plant ? sir, I am a female and i don't wear a cap or turban. please guide how can i use the yantra. Does the practitioner need to wear the headgear all the time? To all the above questions - the Yantra is specific for wearing in any kind of headgear and the same rule is applicable to women who want to make and use the Yantra. The headgear need not be worn every time. As mentioned Bhojpatra and Ashtagandha are essential requirements. The stick of any plant can be used to draw the Yantra. know. I will relly appriciate it. I read your blog every day and follow them also if I am able to find things which are needed. Bhojpatra is commonly available is most Indian cities in almost any shop selling religious or Puja items. He Gurudev, Jinki Kripase Muzhe Gyan Prapt Ho Raha Hai, Unhe Mai Dhanyawad Detahu. Neelji Aap Bhi Ek Guruki Bhati Hame Gyan De Rahe Hai, Mai Aap Ka Bhi Aabhari Hoo. Muzhe Anumati De Ki Aap Ke Diye Huye Mantra Upay, Tantra Upay, Yantra Upayo Ko Upyog Me Laoo, Aur Ho Sake To Dusro Ka Bhi Bhala Kar Saku. Bina Agya Gyan Vyarth Hota Hai, Adhikari Vyakti Ki Anumati Jaruri Hoti Hai. Please go ahead and practice whichever Mantras and Tantras you like, there is no need to ask for permission. Hi Neelji, Hope you are well. I was wondering, is it possible to hide it in the hair for a woman....? I mean, hide the plastic with a black pin and then cover with the rest hair? Kinda half pony or something? Is it possible to do that? I look forward to your reply. Thanks.